Sunday March 4th 1900 We spent the entire day at home. Levi Hill was down from Coralville a part of the day. I read and wrote what spare time I had. Weather colder again. 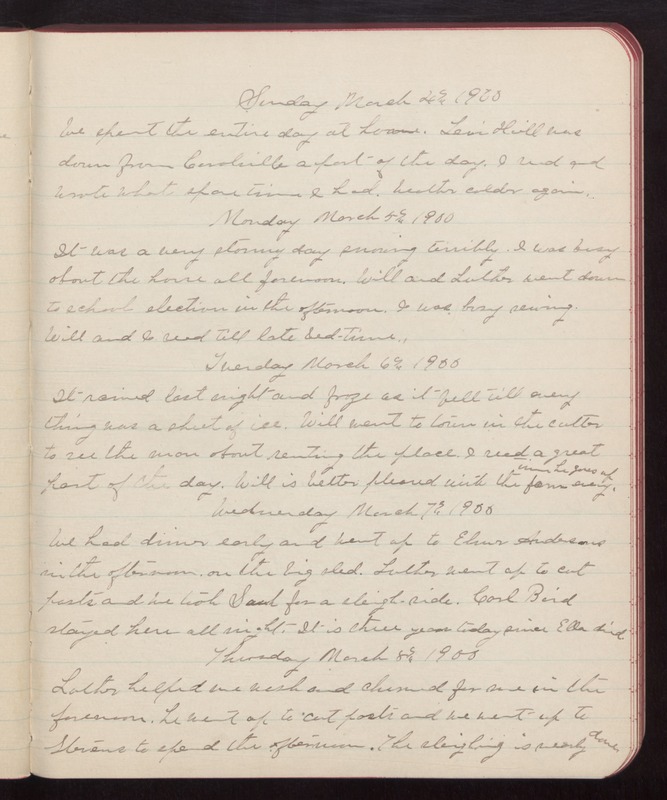 Monday March 5th 1900 It was a very stormy day snowing terribly. I was busy about the house all forenoon. Will and Luther went down to school election in the afternoon. I was busy sewing. Will and I read till late bed-time. Tuesday March 6th 1900 It rained last night and froze as it fell till every thing was a sheet of ice. Will went to town in the cutter to see the man about renting the place. I read a great part of the day. Will is better pleased with the farm every time he goes up. Wednesday March 7th 1900 We had dinner early and went up to Elmer Andersons in the afternoon on the big sled. Luther went up to cut posts and we took Saul for a sleigh-ride. Carl Bird stayed here all night. It is three years today since Ella died. Thursday March 8th 1900 Luther helped me wash and churned for me in the forenoon. he went up to cut posts and we went up to Stevens to spent the afternoon. The sleighing is nearly done.